Heterotopic Ossification: Basic Science, General Principles, and Clinical Correlates in Orthopedic Surgery is a comprehensive, informative approach to understanding the basics through the detailed complexities of heterotopic ossification (HO). The chapters in this book are structured into three main sections: (1) general principles of heterotopic ossification; (2) heterotopic ossification in major anatomic joints; and (3) additional topics and specifics of heterotopic ossification. Each individual chapter is a contribution from a leading expert in the respective subtopic of HO. As a cohesive unit, this book provides a complete reference for students, scientists, clinicians and orthopedic surgeons who find interest in HO or encounter it in the course of patient care. 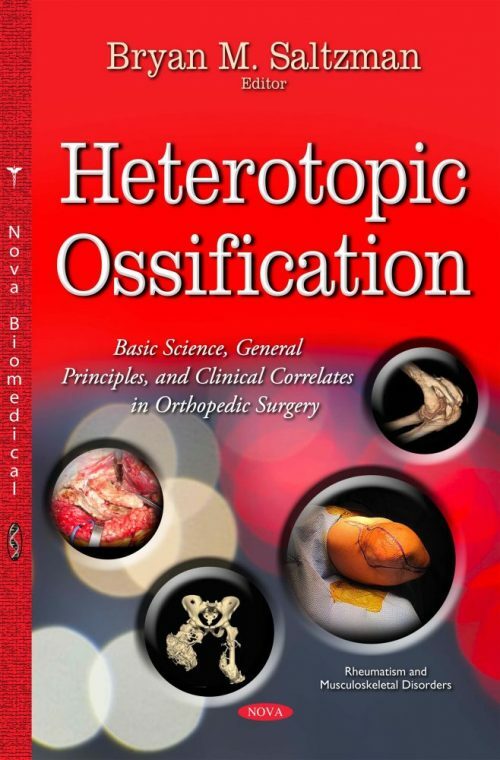 “Heterotopic Ossification: Basic Science, General Principles, and Clinical Correlates in Orthopedic Surgery” is an outstanding reference for the orthopedic community on a problem commonly seen in all orthopedic subspecialties and never before so well summarized in a single volume. Encyclopedic in its coverage, this compact volume will fit the needs of any clinician or research scientist with interest in this disease process. A large number of international experts, thoughtfully assembled by Bryan Saltzman M.D., thoroughly review the basic science underlying the pathogenesis of the disease process, as well as the epidemiologic, clinical and classification principles useful in understanding the pathophysiology as well as the principles of treatment. The process of heterotopic ossification (HO) occurs in all regions of the musculo-skeletal system, but manifests in specific ways based on local anatomy. Therefore a detailed review of the clinical issues on a regional basis is essential. The following chapters are thus regionally based. Comprehensive in their coverage of the clinical aspects of HO, they are also systematic: beginning with a review of pathophysiology, incidence by etiology, risk factors, classification schemes, and clinical manifestations followed by a thorough discussion of treatment indications and techniques. Each chapter is carefully edited, so easily digested, as well as being thoroughly referenced. The final segment of the text reviews additional interesting aspects of heterotopic ossification ranging from a review of animal models, ossification in the nervous system, and combat-related ossification as well other specific systemic pathologies. Each of these chapters, while unique in their orientation, are equally well written, and comprehensive. As a cohesive unit, this book provides a complete reference for high school or collegiate students, scientists, musculoskeletal/rheumatologic clinicians and orthopedic surgeons who find interest in HO or encounter it in the course of patient care.